First up is a member of the highly sought-after Seiko Historical Collection from 2000. Seiko issued seven watches in that year to celebrate their heritage at the turn of the millennium. All were extremely limited editions (500 to 3,000 pieces, depending on model) and they are almost never seen these days. Head over to Musings of a Watch Addict for a fantastic overview of the Historical Collection for more details! Perhaps the rarest of the Historical Collection was this piece, a homage to the world’s first production quartz watch, Seiko’s Astron. Introduced December 25, 1969, the Seiko Quartz-Astron 35SQ was revolutionary, leading to Japan’s dominance of the watch market and nearly spelling the end of Swiss mechanical watches. It cost 450,000 yen at the time, roughly the same as an average new car, but included all the elements of modern quartz movements. Because of this incredible history, it is surprising that Seiko produced just 500 pieces of their commemoration of the Quartz Astron, the 2000 SCQZ002. This watch sold new for 700,000 yen, inflation meant this was less than half the cost of the original but still a hefty price. Both have a solid gold case, however, and both represent the epitome of quartz movement development. The SCQZ002 features Seiko’s best high-accuracy quartz movement, the 9F61. Rated to just to +/- 5 seconds per year, it includes a temperature sensor and aged quartz crystal. The 9F61’s rotor and gear train are sealed in a “cabin”, allowing a claimed service interval of 50 years. Each hand has its own solenoid, and a “twin pulse” system gives the movement greater torque, allowing larger and longer hands to be used. Even if you don’t generally love quartz watches, it’s hard not to respect the 9F61! This particular SCQZ002 is listed on eBay by a Japanese seller at $4,615 currently. That’s a pretty penny, but considering the historical significance, rarity, and solid gold case it doesn’t seem so bad. And that’s actually half the inflation-adjusted price from new! A second listing from the same seller is equally interesting. In 1991, Seiko celebrated their 110th anniversary as a company by introducing a high-end hand-wound mechanical watch, this SCQL002. These days, mechanical watches are the ne-plus-ultra of timepieces, but one must remember that 1991 was a very different time. It was downright radical for Seiko (the king of quartz) to develop and produce an all-new mechanical movement! As the Swiss watch industry began to see a light at the end of a two-decade long slide into irrelevance, Seiko too the opportunity to show that they still had the chops to design a high-end mechanical watch. The heart of this elegant and slim timepiece is their fantastic Calibre 6810. An ultra-thin hand-wound mechanical movement, the 6810 was meant to compete with the best from Swiss companies like Jaeger-LeCoultre, Piaget, and Frederic Piguet. As seen below, the decoration is minimal but the execution is flawless. I could find very little about the 110th anniversary collection from Seiko, but I did find that this watch, SCQL002, was available in both white- and yellow 18 karat gold. The “U.T.D.” legend on the dial stands for “Ultra Thin Dress” and refers to the watch’s obvious distinguishing characteristic. This was not an homage to a product of Seiko past but an attempt to show that the company could compete with the Swiss. 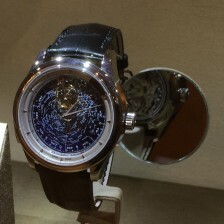 This particular watch is listed on eBay by a Japanese seller at $3,499. That seems like a steal for such an amazing, rare, and historic piece!